If you know me, I’m all about simple, easy, yet delicious recipes! 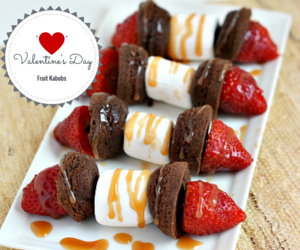 We are in love with these Valentine’s Day Fruit kabobs which makes the perfect dessert idea. I absolutely love them and they are a delicious treat. You could get creative and have different fruit and different kinds of treats to add like short cake or blueberries. Not a fan of dark chocolate? Swap it out with hot fudge or white chocolate. Switch out the Brownie bites for cheesecake or donut holes! I have to say one of my all time favourite combos is Chocolate and strawberries so these fruit kabobs did not disappoint. A simple and delicious way to serve several “mini” treats. Perfect for parties,baby showers,barbecues and Holiday get togethers. Pair with a nice glass of wine and it’s perfect for a romantic date night at home. optional - caramel sauce, chocolate sauce or hot fudge sauce. Clean, dry and cut the strawberries so both ends are flat. Layer the pieces on the skewers in this order, strawberry, brownie, marshmallow & lay them out on a wax paper-lined cookie sheet. Transfer back to the fridge to allow the sauce to set until ready to serve. Valentine's Day Fruit Kabobs- Easy and delicious! What do you like to drizzle on your fruit? Such a fun and versatile dessert. The kids can even help with this one! Very appetizing!! This would make a nice Valentine’s Day treat! This is a great sweet valentines day treat that my little cousins could help make and customize to their liking. The combination of caramel and strawberries is my favorite. Although I am a notoriously bad cook, this looks like something I might make. I love the idea of the strawberries on the ends. Mmmm good. What a fun dessert for Valentine Day. It is also one kids can help make which is another great score. Great Valentines day gift ideas for my partner. Especially we both love sweets and fruits. Ok you had me at Chocolate and strawberries. Nice recipe, thanks! These are so cute! I love valentines day, I am having a card making party and will be adding these to the apps list! These look like a quick and easy treat…not to mention yummy!! What a wonderful and simple plan to put together for a quick and delicious sweet dessert! All my kiddos favorite foods in one bite! These are so cute. My daughter would absolutely love them. My son – well he doesn’t like strawberries but I could come up with some alternative. Great recipe. This looks great and it has everything that my 3yr old just loves. 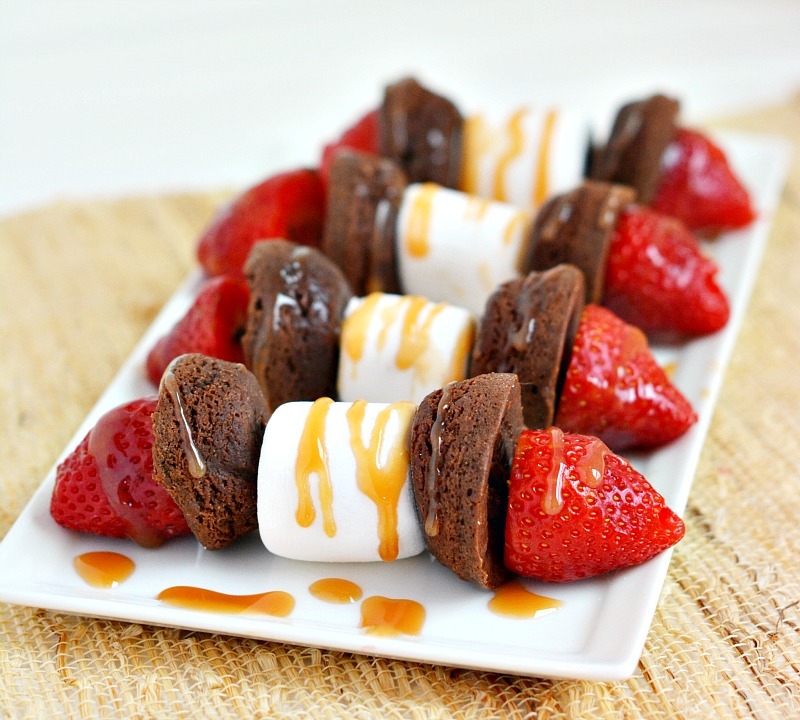 Chocolate, marshmallows and strawberries. I might try this on the weekend. These treats look wonderful! 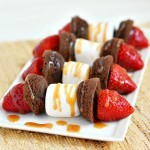 Who doesn’t love strawberries and chocolate with a marshmallow? Yum! omg how cute are these kabobs?!?! my daughter would love to make these. might have to make some! This is an awesome idea for a date night. Thanks for sharing your recipe. It looks so good! I can’t wait to try it! This combo of treats in a bite is too delicious to refuse! I want to make these kabobs asap! This is such a cute and yummy idea. I am going to make these for my work party. Wow what a great idea! I bet my kids would love this for Valentine’s Day! So cute! I can just imagine the delicious mix of flavors.! great way to mark Valentine’s! Looks yummy, I’m not a huge fan of dark chocolate so I would opt for the hot fudge, I do love Strawberries!